The natural pharmacy: Health by nutrients from the kingdom of the plant world - natur-apothekes Webseite! A distribution and marketing cooperation for Spain with international laboratories from the USA, Canada and South America. The offer of health products exists in general of purely natural ingredients. Three manufacturers from North America and South America offer an exclusive offer of food supplement medicine, consisting of a broadly diversified spectrum of vitamins, minerals, amino acids and extracts of herbs. 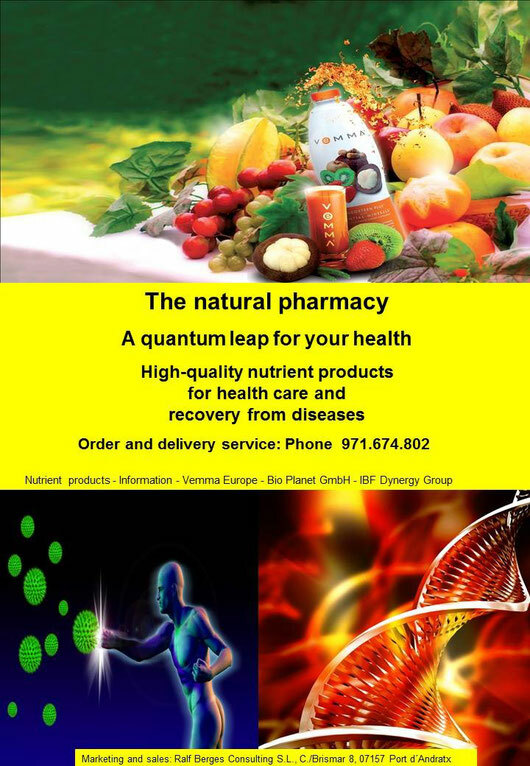 The optimum supply of nutrients of the cell system causes a perfect health precaution and the reconvalescense of diseases. We provide in talks and workshops the basis knowledge about the connection between health and the functionality of the cell system. A product consultation and tips to the better eating habits indicate to you which action alternatives moderate to nutrition are available to you. Order and delivery service from a product assortment of three laboratories. Work of information: „How cells, genes and consciousness influence the health"